You knew Amazon was big. But did you know it was this big? 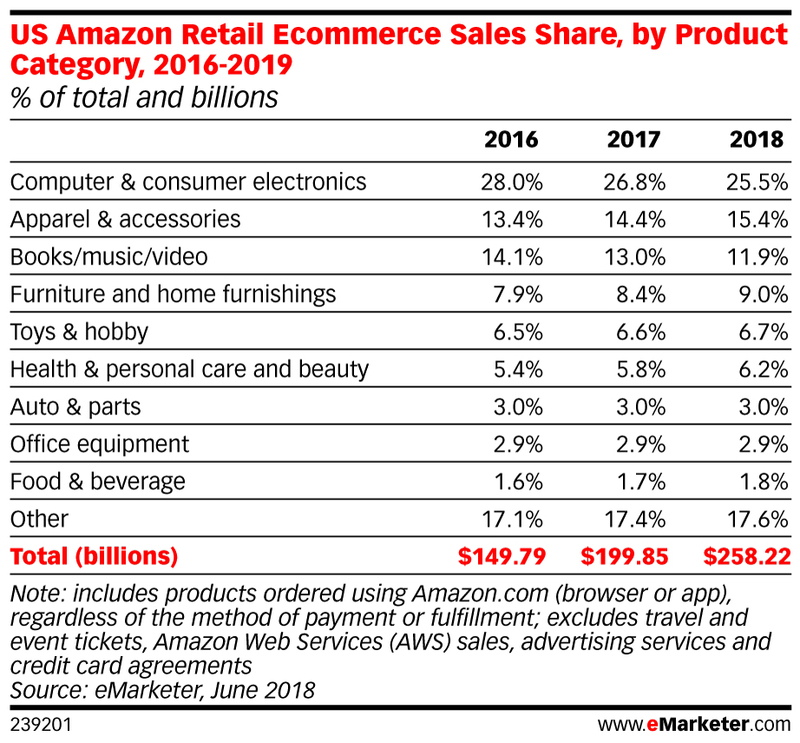 Amazon’s e-commerce sales in the U.S. are expected to reach a staggering $258.2 billion this year, up nearly 30 percent from a year ago, according to a new survey from eMarketer that looks at the company’s sales by product category. 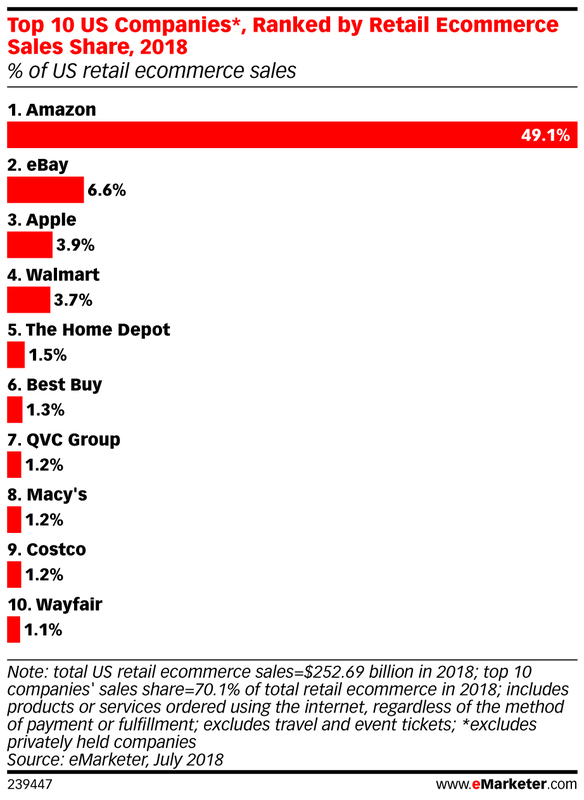 That means Amazon is expected to capture nearly half of the U.S. e-commerce market by the end of 2018, eMarketer said. The company ended 2017 with about 44 percent of the market. In second place isn’t Walmart, like some might expect, but eBay, according to eMarketer’s research. EBay is expected to end the year with about 6.6 percent of the U.S. e-commerce market, Apple with 3.9 percent, and Walmart with 3.7 percent. Next in line are Home Depot, Best Buy, QVC Group, Macy’s, Costco and Wayfair. Also striking is the fact that Amazon’s marketplace is exploding — the marketplace refers to transactions that take place via third-party sellers, instead of a shopper buying one of Amazon’s in-house brands. 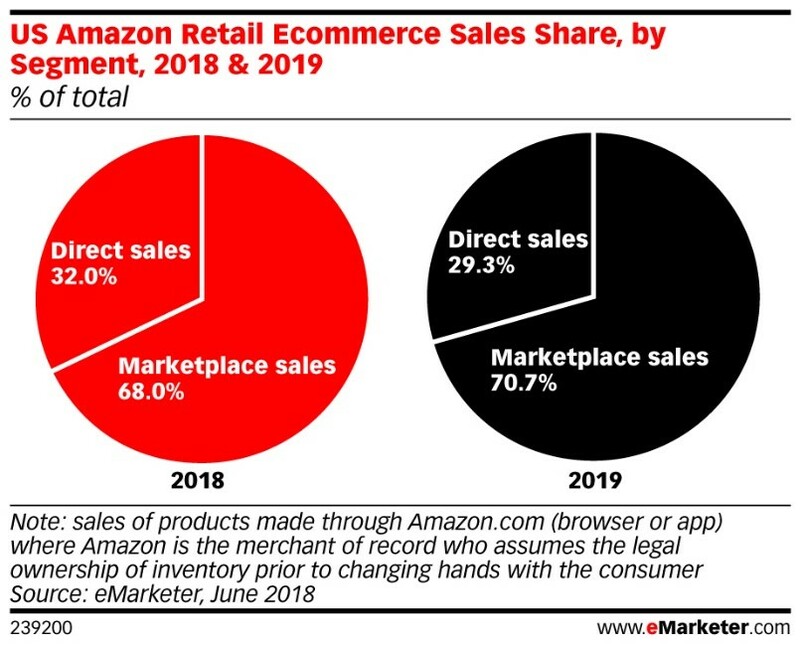 Sales generated from the marketplace will be more than double Amazon’s direct sales in the U.S. by the end of the year, eMarketer said. By 2019, marketplace sales are forecast by the group to be more than 70 percent of Amazon’s overall e-commerce business. In breaking down the product categories, eMarketer has predicted computers and consumer electronics to be the top group of items sold on Amazon.com this year, representing about 25.5 percent of sales — but that’s slightly down from 2017. Growing more rapidly is the apparel and accessories category, which is expected to be a little more than 15 percent of sales this year. The category will have grown a whopping 38 percent from the end of 2017, eMarketer said. Next in line are books/music/video, furniture and home furnishings, and toys. Prime Day 2018, which kicks off Tuesday at 3 p.m. ET and runs through the following day, is expected to give Amazon a huge boost into the latter half of the year. The day of deals draws new, paying Prime members to the platform, which is one reason Amazon continues to grow so rapidly — it has a loyal membership base. Amazon has already started rolling out promotions ahead of the big event. This includes $100 off the Echo Show, 25 percent off Amazon’s in-house furniture brand called Rivet, 50 percent off select Calvin Klein merchandise and ample deals at Amazon-owned Whole Foods.